From the inimitable Daniel Pinkwater comes a funny and disarmingly sweet tale of two forest friends musing on the nature of a good pet. The bear and the bunny are friends who like to wander in the woods, look for things to eat, sing songs, and talk things over. One day, the bunny asks the bear, "Why do we not have some kind of pet?" Well, the bear is not sure what a pet is. So the bunny explains that it's an animal that you take care of and feed, and one that loves you. But a pinecone is not the right pet for a bear and a bunny. And a caterpillar is nice, but it may not be very much fun. After a much-needed nap in the forest, will these two find their perfect pet? 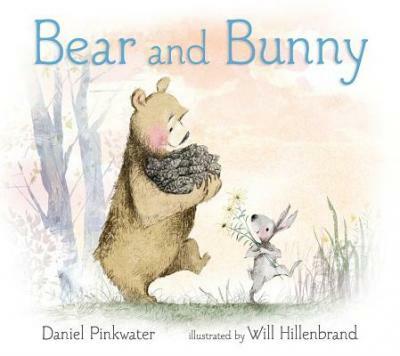 Beloved author Daniel Pinkwater and masterful illustrator Will Hillenbrand return with another charming and humorous story starring the sweetest of friends, a bear and bunny. A wonderful storytime addition and an opportunity for compare and contrast, perhaps with one of Bonny Becker's "Bear and Mouse" (Candlewick) books. --School Library Journal (starred review) It's hard to explain the charm of Pinkwater's quiet story in terms of its plot, since so much depends upon the well-chosen wording, pacing, and tone of the text. Hillenbrand's mixed-media artwork reflects that understated tone beautifully, while portraying the characters and settings with strength and delicacy. A satisfying choice for reading aloud. --Booklist Whimsical, pretty, and endearing. --Kirkus Reviews The gentle storytelling tone, with its affectionate dialogue between the friends, has a Milne-esque echo, and the unseen narrator's witty but delicate take on the misunderstood-species joke ("It would be too hard to explain it to them. Besides, it doesn't matter") will tickle youngsters' funnybones. --Bulletin of the Center for Children's Books Pinkwater's meandering narrative mimes children's improvisational storytelling, and there are plenty of chuckles to be had over the misunderstandings of his none-too-bright characters. --Publishers Weekly Like Russell Hoban, Daniel Pinkwater has a way with words that is both humane and arch; it often feels as if he must be smiling as he writes. In "Bear and Bunny," a stand-alone sequel to 2012's "Bear in Love," Mr. Pinkwater again teams up with illustrator Will Hillenbrand for a beautifully paced, neatly written story of two forest friends and their somewhat confused ideas about the world. Daniel Pinkwater is the author of many books for children, including Bear in Love, also illustrated by Will Hillenbrand, and a series of books about Mrs. Noodlekugel, illustrated by Adam Stower. Daniel Pinkwater lives in New York State. Will Hillenbrand has written and illustrated dozens of books, including Daniel Pinkwater's Bear in Love, Jane Yolen's This Little Piggy, Amy Ehrlich's Baby Dragon, and Phyllis Root's Kiss the Cow! He lives in Ohio.